Types of Art: Oral tradition reports that, after success in war, the Mbembe chiefs would start a new village and have a statue erected to themselves while still alive (as opposed to the Igbo, who waited for one year after the death of their chief). Three names of ancestors have remained in Mbembe memory: Appia, who died in 1663; Mabana, of the sixteenth century, whose statue still exists; and N'Ko who founded the village of N'Koum and demanded that the head of his statue be cut off after his death and buried with his body, to testify to his struggle for liberty. These statues are as imposing as the drums. 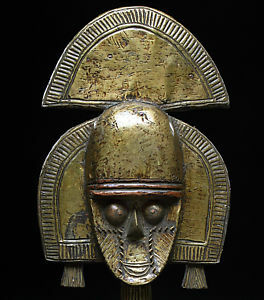 The Mbembe have also sculpted some heads and headdresses, as have the Ekoi, the Anyang, and the Boki, their neighbors. History: The Mbembe are an ethnic group of about 40,000 people who settled on the banks of the Cross River and the Ewayon in a region of poor cultivation. From the sixteenth century on, the Mbembe had to defend themselves against raids by coastal tribes, procurers for the slave trade. They are divided into five groups: the Adun, Osopong, Ovium, Ofunbonga, and Okpodou. The villages were established on the edges of dense forest or on hilltops. Their huts, made of mud and wattle-fencing, are covered with palm raffia. Economy: There are three economies - based on location: savannah north of the river, the forested riverain area south of it, and the deep forest area further south. The first two economies are based on yam growing and on the production of surplus yam for export, but their agricultural system is different from many areas. That of the rice rain area has been described by Forde, and involves clearing large areas of forest. The economy of the deep forest region is not based on yam growing, but on plantains, and cocoa yams, both shade-loving plants, and men rely for their cash income on hunting and on the export of smoked dried game. Political Systems: The avat, chief of the village and priest, represents his clan, names the sanctuary guardian, and organizes meetings with the other avat. He intervenes during litigations. To not sow is thought of as, a sacrilege which requires the avat to rule quickly on conflicts. As an emblem, he wears a hoop of leopard jaws, a kind of red head covering, and bracelets of copper coins. The inhabitants of the village must give him wine and meat. According to R. Harris (1984), the men belong to two associations, the ocheika and the okwa. The latter exercises social control and organizes the community's work. Its members choose the village chief and have the power to depose him. The male ijong society practices sorcery and organizes celebrations at which the host must pay a tribute and present the spirit of his ma trilinear clan. One becomes a member of the association in order to become richer or to avenge the death of a relative. There are usually only two or three sorcerers per village. For the Mbembe the universe is good, and evil always has sorcery or the transgression of a taboo at its origin. For the juju rite, adopted by the ethnicities of the Niger delta, the Mbembe used a drum, the ikoro, 3 to 5 meters long. Kept in the sanctuary, it served as a sacrificial altar in earlier times. The kneeling victims would have their head cut off above the drum; the heads would be placed next to those of enemies killed in a war. No man could see the drum if he had not offered a head. The sound of the drum could be heard for 10 kilometers. Twice a year, initiates would 'dance in front of the sanctuary and sing of their armed feats. After colonization, the English burnt several of these drums in order to prohibit these ritual crimes. Religion: For the Mbembe, the invisible world is divided into three categories: a creator god, lbinokpabe; the dead, afranong, mediators with the gods, who punish or reward according to their own interests; and lastly, the akwa spirits, intermediaries between the dead and the living, providers of medicines, who are at the heart of religious life. The diviners, obongonong, are summoned by Ebok, a personification of thC power of divination; to evade his demands would bring sickness. The diviner is responsible for identifying sorcerers, discovering the causes of illnesses, as well as determining the name of the ancestor reincarnated at the birth of a child. He regulates the acquisitions and atonements to the akwa.